Powerful and reliable, this Rechargeable LED Spotlight sheds an impressive 530 lumens of light with its super-bright Cree XLamp XR-E LED. The Spotlight provides 2.5 hours of runtime on a single full charge -- or it can be used while plugged in. There's a trigger switch for ON/OFF, and a slide switch for continuous ON operation. The LEDs keep the spotlight cool to the touch, while the comfortable non-slip grip and integrated hanging feature make it easy to use in all kinds of conditions. 120V and 12V adapters are included. 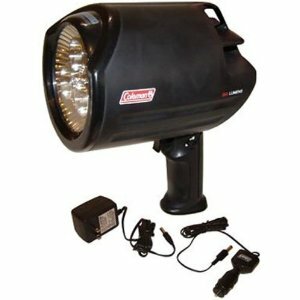 The Rechargeable spotlight has a battery that is integrated into the unit.